Today is the first day of Autumn! I think we’ve all seen some pretty great Fall decorations thus far! Tons of mums, gourds, corn stalks and pumpkins. All sorts of pumpkins! Velvet pumpkins, harlequin pumpkins, painted pumpkins… I decided to try my hand at painting a plastic pumpkin I bought from the grocery store yesterday. How did it turn out? Well…. I painted the shiny plastic orange pumpkin with white chalk paint. My idea was to paint the stem gold and the pumpkin white then add some dark wax to age it. The paint was very thick so I painted it and left it to dry. Upon my return, much to my dismay, the paint had a crackle effect. Not what I was hoping for at all! As a matter of fact, the paint was peeling off in chunks. So, I peeled off the rest and started from scratch. So much for my manicure. 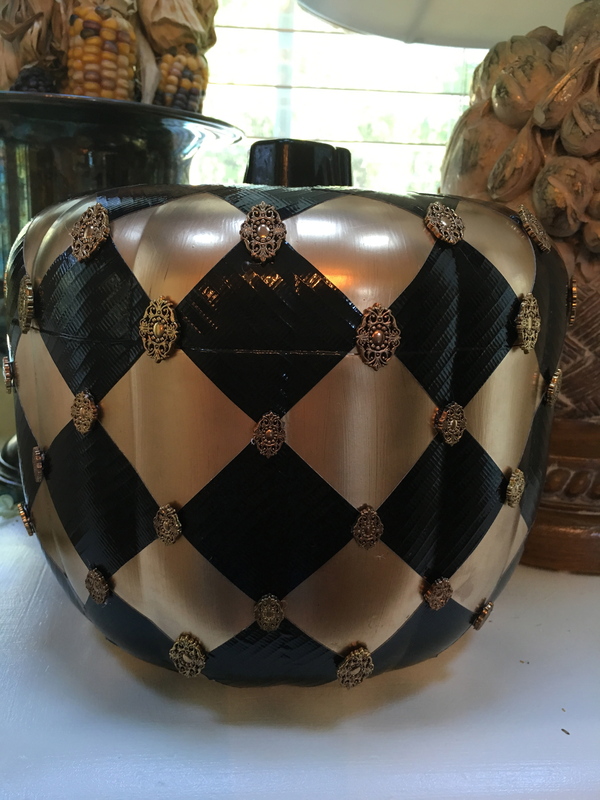 Since my gold pumpkin still looked a bit plain, I added squares of shiny black duct tape in a harlequin pattern. The tape is repositionable if you do it carefully. (The duct tape was about $4.99 also from Amazon.) I love how it turned out! But I still wasn’t done. I had some ornate gold buttons (also plastic) so I snipped the loop off of the backs and hot glued them to the pumpkin in between the diamond pattern. Now I’m loving my knock off harlequin pumpkin! So, typical for me what began as one thing turned into something completely different! Sometimes it’s a good thing! So here’s my tip: Don’t use chalk paint on shiny plastic. Use a paint made especially for plastic. Or use Martha Stewart’s gilding and add a little duct tape and jewels for fun! Hope you have a wonderful and successful day! Happy Autumn, Friends! Painted plastic pumpkins-Does it work? How To Clean Wine Glasses! Gift Wrapping Station – Throwback Thursday! That is amazing, Dell! It’s very pretty, Martha, Jr.!